This booth is a mini fashion salon ,including 3 dressforms and possible 2 life models. The Arduino club of ITE college East is back again this year, showcasing new hardware electronic projects using Microcontrollers such as PIC and Arduinos, and different types of mobile robots which can be controlled using smartphones and personal computers via the internet. Sets of ‘reconfigurable robot kit’ for the visitors to build their own robot using the hardware provided. A instructor will be assigned to help the visitors at each station. Each station can train 1-3 participants at one time. Every slot will take around 30-45 mins. We will use OpenCV to capture the profile of a person and then project the profile by laser into the screen. All is done by a single computer called pcDuino. 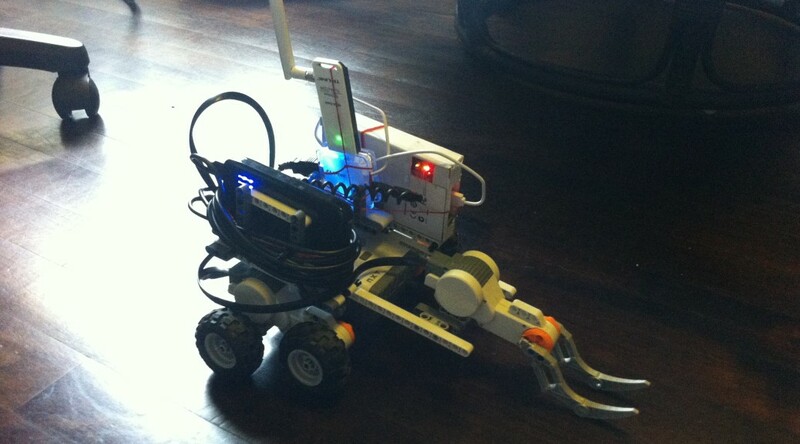 Steer a home-made remote controlled robot with Beer (or Coke) can grabbing capability over wifi! See what the robot sees using a Raspberry Pi camera! Drive and activate the can grabbing claw over an SSH connection! Ask insightful questions! Also starring an iPad controlled RepRap Huxley that will be making demo prints from a custom built noise controlled case. A synesthete is a person who experiences a secondary sensation of sound as colour or colour as sound. “The Synesthete’s Music Machine” is a music-making device that imagines how a synesthete is able to ‘hear’ colours. Coloured objects provide visual cues for a machine that interprets what it sees into the form of sound. The audience interacts with the device by using physical objects to create their own sounds in a fun and experimental way. The machine will be built using open source hardware and software such as Arduino and Processing. ZenGlove is a wireless sensor glove which can model a human hand digitally. It can be used to interact with the digital world as if you were in it. Catapy is a toy car that provides the fun of chase. Catapy itself is a palm-sized motorized car covered by a caterpillar track, and it is able to run across a field freely with cute action. People therefore can enjoy chasing Catapy. In this Maker Faire, we show Catapy Mega which is 10 times bigger than the original Catapy. It is huge, fast, and so hot. Let’s chase it! At the Centre for Quantum Technologies, we study how we can make use of the strange properties quantum mechanics to power the technologies of tomorrow. A lot of the equipment used to probe and understand quantum systems is custom designed and built in house. We will showcase some of the tools we make and demonstrate a few quantum technologies along the way. Food and beer technologies at SMMF 2014! The basis of my designs are how homopolar motors works based on Michael Faraday’s Law of Electromagnetism. I am attempting to incorporate the simple motor into a number of attractive items useful for decorative purposes. There are a few neodymium magnets stuck under a normal battery. Magnets have a magnetic field. When there is a current flowing in the copper wire it causes a magnetic field around the wire. When both the magnetic fields interacts with one another the wire experience a force making the wire loop spin. You obtained the magnets from online after much extensive research and tested your motor with scraps of copper that wire given to me by my father. Ever wanted to make lightning at home? View up close and in detail the various electrical projects and Tesla Coils Guangyan has been building over the past decade in his room. 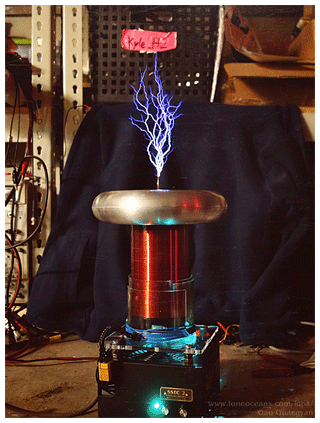 Find out how power electronics is revolutionizing the world of Tesla Coils, and how the newest musical Tesla Coils play music through electrical sparks! Gao Guangyan shares his projects and experience as a maker and engineer, known for his crazy home projects and Musical Tesla Coils. Follow his journey and learn how he makes lightning at home with an introduction to Tesla Coils, and view up close the inner workings and see hair-raising live-demos of some new Musical Tesla Coils he has built including a new large one in the Singapore Science Centre. It is simple to make Gadgets using Arduino and the family can have fun together too. SmartSail visualizes the subtle changes of the sail not only to its sailor for making controlling a sailboat easier. This entry was posted in Uncategorized and tagged engineering, Science, technology. Bookmark the permalink.